We’ve all heard the sayings, “keeping it classic,” “throwback Thursday,” and “old-school style.” People have always had a nostalgic soft spot for all things considered old-fashioned or, in other words, classic. In the world of online gambling, there is bound to be an original that your favorite casino game was based on. With slot games, the category titled “classic slots” pays a very obvious homage to the 3-reeled ancestors of our favorite noisy and colorful fruit machines. Since their introduction into the market in the late 19th century, slot machines have come a long way. Innovations in slot technology include the ability to process different forms of money, electromechanical devices that cause the reels to spin without levers and springs, and, of course, the use of random number generators which allow gamblers to play video slot games. But classic slots, which resemble the more traditional machines first found in bars and on casino floors, live by one motto: the simpler the better. With three reels and one payline, these slot games – whether they are physical machines with moving reels or video depictions of them – resemble the one-armed bandits that we have come to know and love. And let’s be real, who doesn’t dream about a getaway trip to a land-based casino or marathon online bender playing our favorite classic slot game? Classic 3 reel slots machine games take a lot of functional elements from more primitive slot machines. In the old days, slot machines didn’t have the capabilities to accept different forms of currency or the ability to discern different payment amounts within the same currency. Because of this, land-based casinos developed a whole system of payment which revolved around coins. You may have seen this at real casinos: little old ladies and middle-aged men in flip flops and cargo shorts, strolling down rows of slot machines sporting a big popcorn bucket full of clinking, golden coins. As the machines advanced, they could start to accept one, two, and up to three coins per play. The more you bet, the bigger payout you received and if you bet the maximum possible number of coins, you were eligible to win the huge jackpot! As mentioned before, classic slots aren’t only the weight and lever-operated, real-life machines – classic slots are actually a popular genre among online casinos. With the constant addition of more classic slot games, it has become a category with an impressively wide variety. As you know, online slot games don’t need to process different currencies because you choose the exact amount of money to put down with each bet, and that has already been translated into electronic values. This allows you to bet anywhere from one penny to one hundred dollars per spin. And yet, classic online slot games still use coins. Why do people like this? This format actually has its advantages, as you can choose the denomination, or what a single coin value is worth. The paytable is super simple and easy to understand. With only one payline, the paytable can explicitly illustrate each winning combination of symbols and tell you how many coins you win for bets made of either one, two, or three coins. The proportion of coins you win will always be the same, regardless of the bet you make. So you can really start to see how betting higher amounts pays out to your advantage! Coins aren’t the only things that classic slots have borrowed from the good ol’ days. In case you wanted a little history lesson, way back when, gambling was outlawed and it became illegal for slot machines to give out cash prizes. To get around this, slot machines gave out gum instead, and the flavor you received depended on the combination of symbols that the reels landed on. That’s why slots famously use fruit symbols – because of the fruit flavored gum. It was a nifty little game and a fun prize during prohibition, when casinos and bars were significantly harder to come across. A lot has changed in the slot industry, but gamblers still fondly play fruit machines with their favorite cherry, melon, and plum symbols. You may also see the BAR symbol appear quite often on the real or video reels of a classic slot machine. This comes from the same history as the fruit gum machine. Legend says that the BAR symbol is based on the Bell-Fruit Gum Company logo, because they were the producers of the slot machine gum prizes. Since then, the symbol has been taken and reproduced. Instead of representing the gum company, the BAR symbol has become a well-known and instantly recognizable indicator of a slot machine. Classic slots indulge in a little reminiscing with most of their visuals, but some video slots have also taken steps towards modernization. Classic video slots will often have special features like scatters, so if a certain amount of these symbols appear anywhere on the screen you automatically win. This only works for video slots because a real machine wouldn’t be able to recognize symbols that don’t appear on the payline. 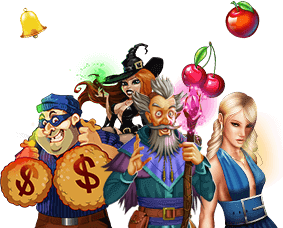 Some classic slots also feature multiplier or bonus symbols, giving you the possibility of winning free spins and up to 20 times your initial earnings. If you don’t want the fancy features but you’re still looking for a little something extra, check out classic progressives. It has the same simple interface that you’ve gotten so used to, but the potential jackpot winnings will knock your socks off! Bigger isn’t always better. With slot games, newcomers can often feel overwhelmed by all of the symbols, reels, and other moving parts. The rules are numerous and confusing, but classic slots are simple and easy to get the hang of. With only one payline and a coin betting system, there isn’t much to learn. This frees you up to spend your time enjoying the game rather than figuring out what each button does. If you want some exciting flavor, then find a classic slot with fun features. There are tons of classic slot games out there. A couple fan favorites are Sevens & Stripes and Bank On It! Sevens & Stripes is a great game for those looking to express some lucky patriotism – after all, what’s luckier than sevens in America’s beloved red, white, and blue? This progressive slot will have you spinning from all of the winning combinations, and the constantly growing jackpot is super rewarding. If you’re in the mood for a little more of a modern, money-making apparatus, Bank On It! is the perfect game for you! With three reels and a readily viewable paytable, you’ll pick up this game in no time, meaning you can focus your energy on making some bank! Head over to Slots of Vegas and check out all of the classic slot games they have to offer – you never know when you might hit your next lucky spin!